In 1535 Henry VIII began to close the monasteries in England. Most people living in the North of England were still strong supporters of the Catholic faith. The monasteries made a substantial contribution to the local economy. The Benedictines in Durham had for a long time operated coal mines in the region. The Cistercians had introduced commercial sheep farming in Yorkshire. Unemployment was increasing and if the monasteries were closed down, this would cause further problems as they employed local people to carry out most of the manual work needed. Those who worked the land were also worried about the changes that were taking place. The transfer of land from open field to enclosure and from arable to pasture also increased unemployment. On 28th September 1536, the King's commissioners for the suppression of monasteries arrived to take possession of Hexham Abbey and to eject the monks. They found the abbey gates locked and barricaded. "A monk appeared on the roof of the abbey, dressed in armour; he said that there were twenty brothers in the abbey armed with guns and cannon, who would all die before the commissioners should take it." The commissioners retired to Corbridge, and informed Thomas Cromwell of what had happened. The following month disturbances took place at the market town of Louth in Lincolnshire. The rebels captured local officials and demanded the arrest of leading Church figures they considered to be heretics. This included Archbishop Thomas Cranmer and Bishop Hugh Latimer. They wrote a letter to Henry VIII claiming that they had taken this action because they were suffering from "extreme poverty". Soon the whole of Lincolnshire was up in arms, but "the gentry promptly asserted their control over the movement, which might otherwise have got dangerously out of hand". 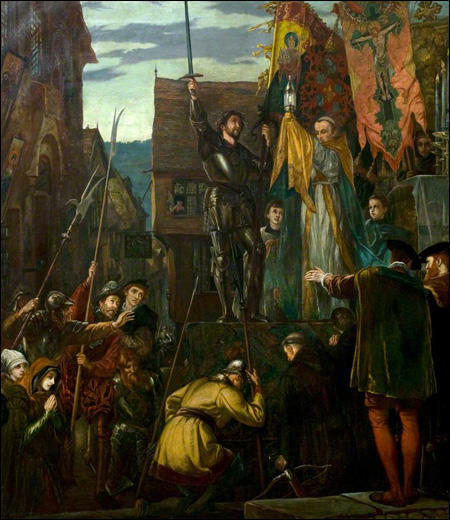 (Source 1) The Beginning of the Pilgrimage of Grace in Lincoln in 1537. The monasteries as a whole might spend no more than five per cent of their income on charity, but in the North they were a great deal more generous, doubtless because the need was greater in an area where poverty was more widespread and very real. There, they still did much to relieve the poor and the sick, they provided shelter for the traveller, and they meant the difference between a full belly and starvation to considerable numbers of tenants, even if they were sometimes imperfect landlords. It would be incorrect to view the rebellion in Yorkshire, the so-called Pilgrimage of Grace, as purely and simply an upsurge of militant piety on behalf of the old religion. Unpopular taxes, local and regional grievances, poor harvests as well as the attack on the monasteries and the Reformation legislation all contributed to the creation of a tense atmosphere in many parts of the country. 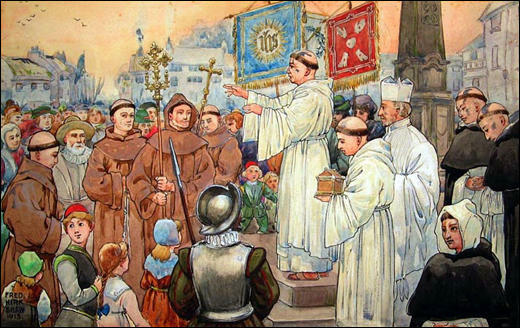 (Source 4) Robert Aske made a speech about the Pilgrimage of Grace in York in October 1536. We have taken (this pilgrimage) for the preservation of Christ's church, of this realm of England, the King our sovereign lord, the nobility and commons of the same... the monasteries... in the north parts (they) gave great alms to poor men and laudably served God... and by occasion of the said suppression the divine service of Almighty God is much diminished. (Source 5) Eustace Chapuys was King Charles V of Spain's ambassador in England. In 1537 Chapuys sent a report to Charles V on the Pilgrimage of Grace. It is feared that he (Henry) will not grant as he ought the demands of the northern people... The rebels... are sufficiently numerous to defend themselves, and there is every expectation that... the number will increase, especially if they get some assistance in money from abroad. They called this... a holy and blessed pilgrimage; they also had banners whereon was painted Christ hanging on the cross... With false signs of holiness... they tried to deceive the ignorant people. Including women and children the greatest assembly was that of fifteen thousand at the Broadfield. Twenty thousand men, women and children may have actively supported the rebellion at some stages, and many more may have taken the rebel oath before returning to their homes... If one accepts an estimate for the total population of the region of approximately seventy thousand in 1536, the fact that over one-third of the inhabitants were active rebels indicates a high level of involvement. Appointed the king's lieutenant to suppress the Lincolnshire rebels, he advanced fast from Suffolk to Stamford, gathering troops as he went; but by the time he was ready to fight, the rebels had disbanded. On 16th October he entered Lincoln and began to pacify the rest of the county, investigate the origins of the rising, and prevent the southward spread of the pilgrimage. The Pilgrimage of Grace... was a reactionary, Catholic movement of the North, led by the still half-feudal nobility of that area and aimed against the Reformation and the dissolution of the monasteries. But if the leaders were nobles the mass character of the rising indicated a deep discontent and the rank and file were drawn in large measure from the dispossessed and from the threatened peasantry. John Bulmer... with other traits, at Sherburn, Yorkshire, conspire to deprive the king of his title of Supreme Head of the English Church, and to compel him to hold a certain Parliament and Convocation of the clergy of the realm, and did commit diverse insurrections... at Pontefract, diverse days and times before the said 10th of October. Cause such dreadful executions upon a good number of the inhabitants hanging them on trees, quartering them, and setting the quarters in every town, as shall be a fearful warning. The King's Highness also desireth your lordship that ye will make due search of such lands, offices, fees, farms, and all other things as were in the hands and possession of the Lord Darcy, Sir Robert Constable, Sir Francis Bigod, Sir John Bulmer, Sir Stephen Hamerton, Sir Thomas Percy, Nicholas Tempest, and all the persons of those parts lately attainted here and to certify the same to His Grace, to the intent the same may confer them to the persons worthy accordingly, and likewise to cause a perfect inventory of their goods, lands, and possessions to be made and sent up with convenient speed as shall appertain. You are to be drawn upon a hurdle to the place of execution, and there you are to be hanged by the neck, and being alive cut down, and your privy-members to be cut off, and your bowels to be taken out of your belly and there burned, you being alive; and your head to be cut off, and your body to be divided into four quarters, and that your head and quarters to be disposed of where his majesty shall think fit. Nearly all the noblemen and gentlemen of Yorkshire had joined the Pilgrimage of Grace in the autumn. Henry could not execute them all. He divided them, somewhat arbitrarily, into two groups - those who were to be forgiven and restored to office and favour, and those who were to be executed on framed-up charges of having committed fresh acts of rebellion after the general pardon. Archbishop Lee, Lord Scrope, Lord Latimer, Sir Robert Bowes, Sir Ralph Ellerker and Sir Marmaduke Constable continued to serve as Henry's loyal servants. Darcy, Aske, Sir Robert Constable, and Bigod were to die. So were Sir John Bulmer and his mistress, Margaret Cheyney, who was known as Lady Bulmer but was not lawfully married to him. Leaders executed including Lord Darcy and Hussey, Sir Robert Constable, Sir Thomas Percy, Sir Francis Bigod, Sir John Bulmer, and Robert Aske. Clerical victims were James Cockerell of Guisborough Priory, William Wood, prior of Bridlington, Friar John of Pickering, Adam Sedbar, abbot of Jervaux, and William Thirsk of Fountains Abbey. Nothing is succeeded since my last writing but from good quiet and peace daily to better and better. Thetraitors have been executed, the Lord Darcy at Tower Hill, the Lord Hussey at Lincoln, Aske hanged upon the dungeon of the castle of York, and Sir Robert Constable hanged at Hull. The residue were executed at Tyburn. Question 1: Read the introduction and study sources 2, 3, 4, 9 and 11. Give as many reasons as you can for the Pilgrimage of Grace. Question 2: Do you think the artists who painted sources 1 and 10 were supporters or opponents of the Pilgrimage of Grace? Question 3: Read the biographies of Eustace Chapuys and Edward Hall. Give reasons why these two men might not be providing completely reliable information. Question 4: How many people took part in the Pilgrimage of Grace. Why is it difficult for historians to give an accurate number of people involved in this movement? Question 5: Read sources 12 and 14. Explain why Henry VIII wanted the leaders of the Pilgrimage of Grace to be punished in this way. Question 6: Sources 13, 15 and 16 give the names of the leaders of the rebellion who were executed. Source 15 gives the name of a person who is not mentioned in 13 and 16. Can you give reasons for this.